Thank you to The Home Depot for sponsoring this post and providing us with everything we needed to complete our backyard makeover. All ideas and opinions are my own. 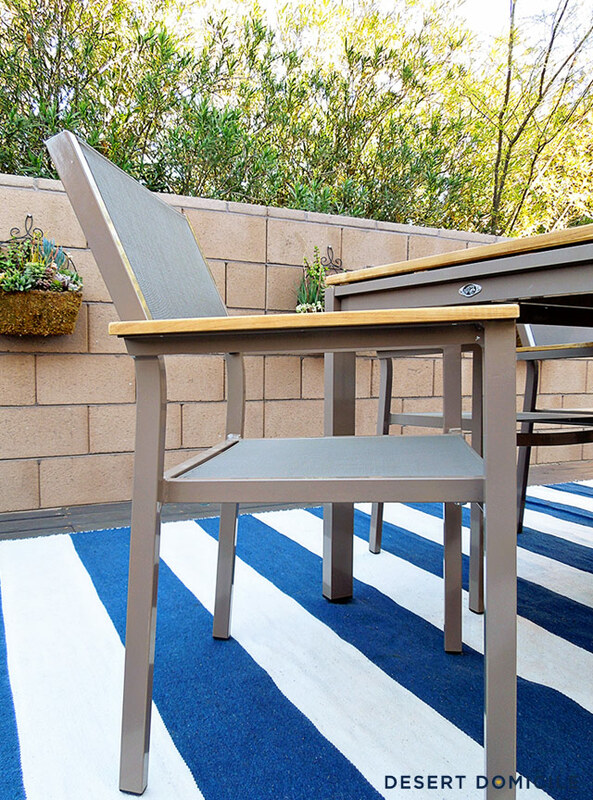 I shared some sneak peeks of our Home Depot Patio Style Challenge last week and today I'm revealing our new backyard here AND on Home Depot's blog! 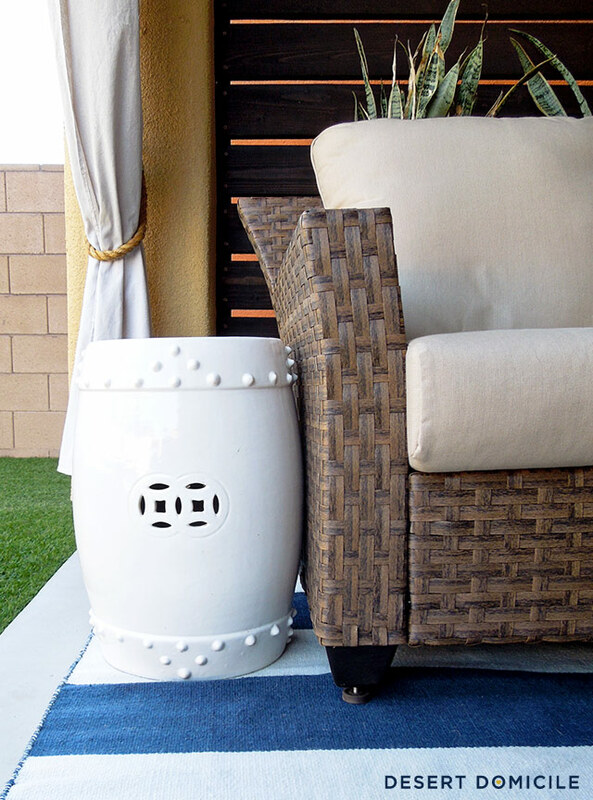 In my sneak peeks post, I had mentioned that we'd be doing a little more for our Patio Style Challenge and today is the day I get to share a big secret I've been keeping from you! I still can't believe that they chose me for their ultimate Patio Style Challenge but I'm so grateful and can't thank The Home Depot enough! Not only did they trust me to design every component of our yard, they also let me pick out everything that went in it as well! I'm still shocked that everything is done because we've lived with dirt since the day we moved in almost 3 years ago (check out some before photos here). THAT was our yard. For 3 years. It kept getting uglier while the inside of our house kept getting prettier! I hope you've recovered from my first bombshell because I'm about to drop another one! Ready? The entire makeover was filmed from start to finish! Yep, everything was documented by an incredible crew from Flynnside Out Productions. I got to meet Brian Patrick Flynn, the owner of Flynnside Out and a design idol of mine, when he and his photographer, Sarah Dorio, flew out to photograph our space! I tried to keep my cool and not have a fan girl moment in front of him but it was really, really hard, especially when he complemented our house! – (insert the shocked face Emoji here) – I don't know if he was just being polite or not but I about died! Anyway, back to the video bombshell! All of the videos (yes, plural) will be released soon and I can't wait to see them when they go live! I'll be seeing them when you see them and I'm really hoping I didn't make a fool of myself haha I'm used to being behind the screen/lens so being in front of it took a little getting used to. Whew! 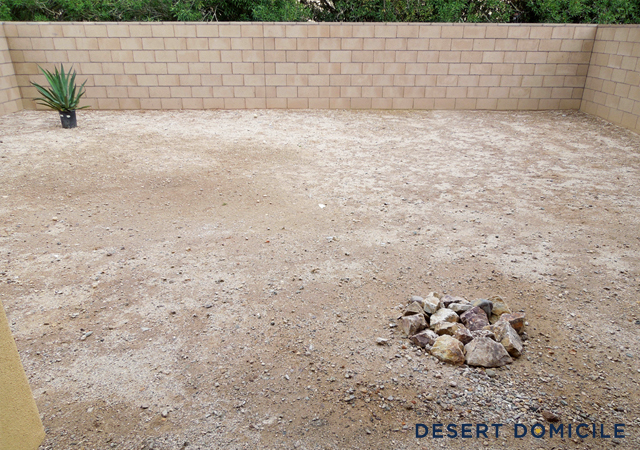 Now that the cat's out of the bag, are you ready to see our new backyard?! Get your scrolling finger ready because I have a boat load of photos and info to share! 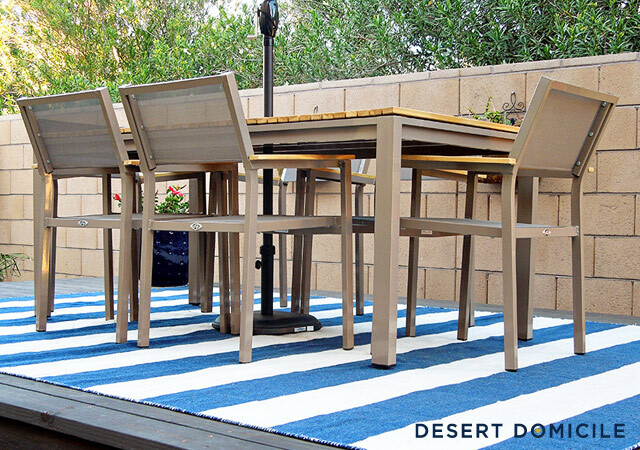 For those of you that don't know, the regular version of The Home Depot Patio Style Challenge involves making over your patio area with a patio set from The Home Depot and a few DIY projects from your brain (or Pinterest). 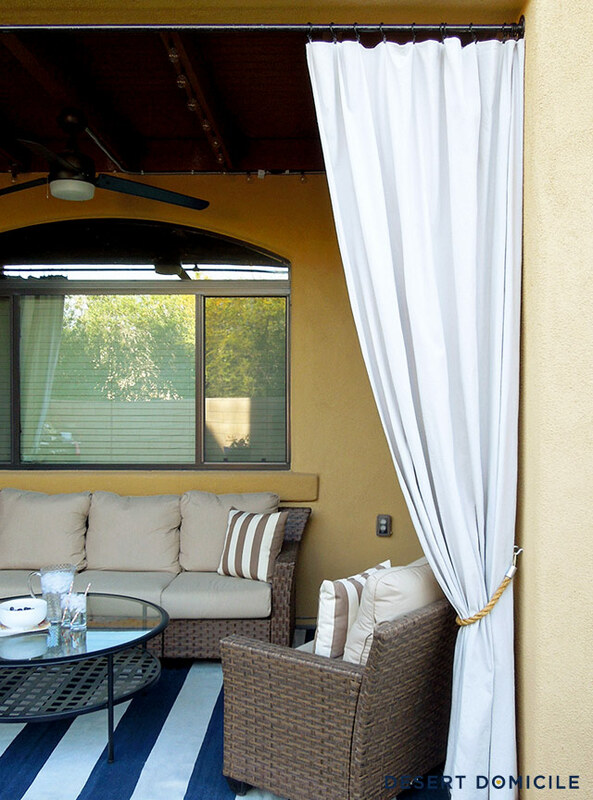 I wanted to make our covered back patio feel less like a patio and more like a private outdoor room. 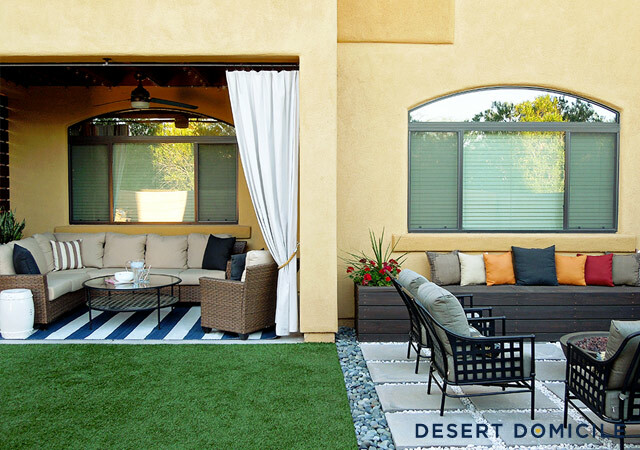 A cabana-like area kept coming to mind but unfortunately, we don't have a pool or live near a body of water so this is my version of a desert cabana! One side of our patio was open to our side yard and even though I love open concept everything (have you seen our house? ), I wanted to add a slatted screen that would give us some privacy and block the view of our neighbor's house while still letting light and air in. 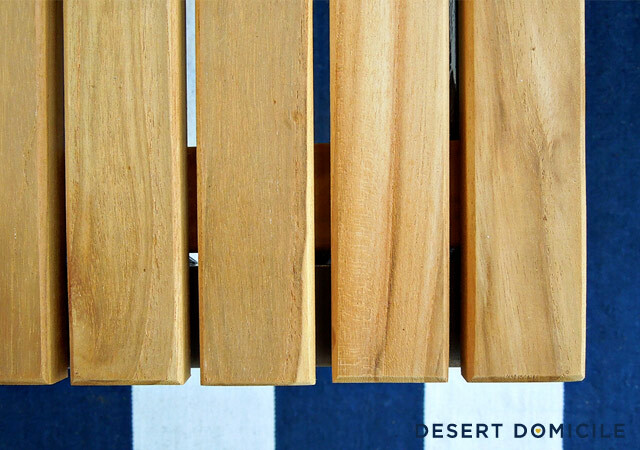 I plan to hang a piece of art from the slatted screen soon, I just haven't found the right piece yet! 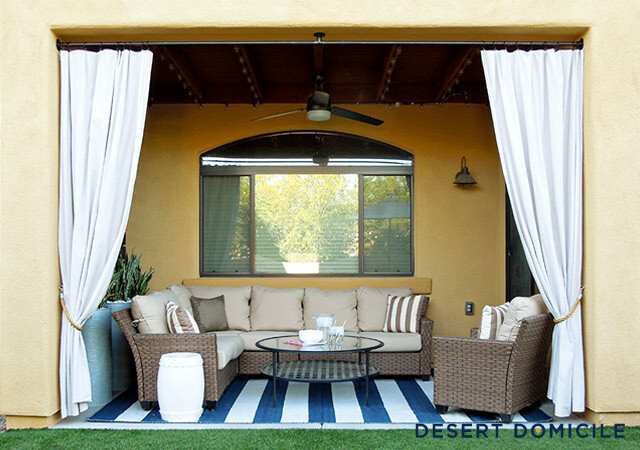 I also wanted to add some outdoor curtains to help complete the cabana-like look. I made a curtain rod out of pipe supplies so it would match the curtain rods we have all throughout our house and help make the space feel like it's an extension of the indoors. I used a drop cloth for curtains because extra long curtains are super expensive haha I cut the drop cloth in half and clipped each piece up with curtain clip rings so I could take the pieces down and wash them as needed. 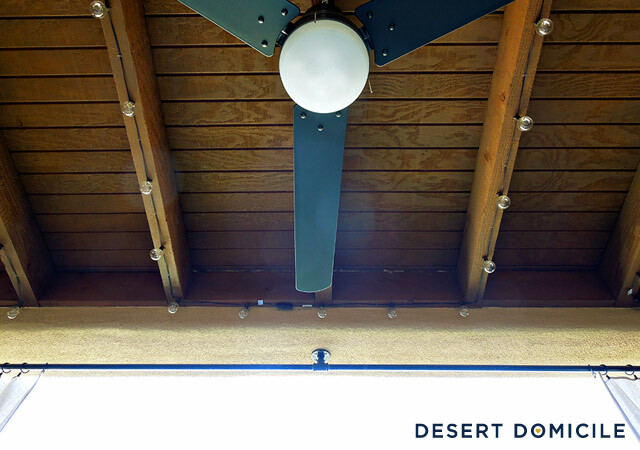 We finished off our space with an outdoor ceiling fan and string lights. I was worried that the ceiling fan was just going to move hot air around but it actually does a great job of cooling the space down and providing a breeze when Mother Nature doesn't! The string lights provide a romantic ambience at night and help illuminate our yard a little so we can see what our dogs are doing. 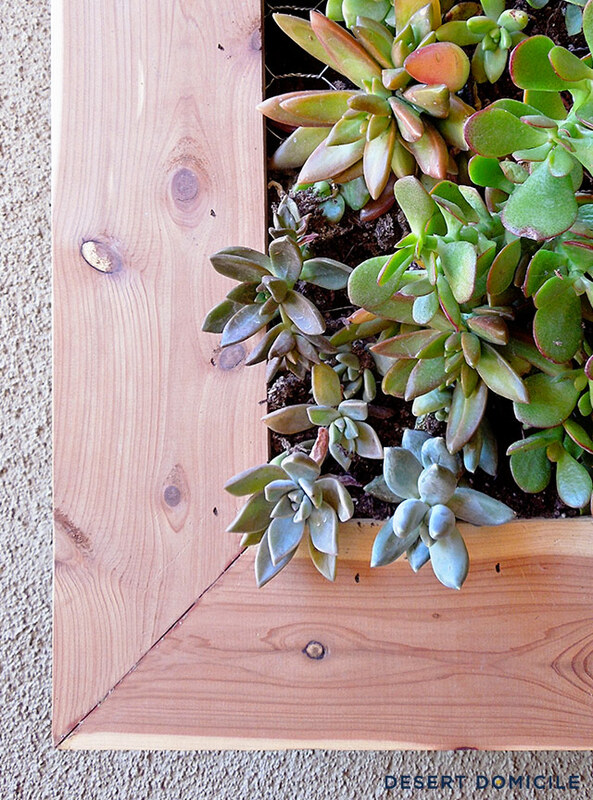 After all of the DIY projects were done, I started styling our space – my favorite part! 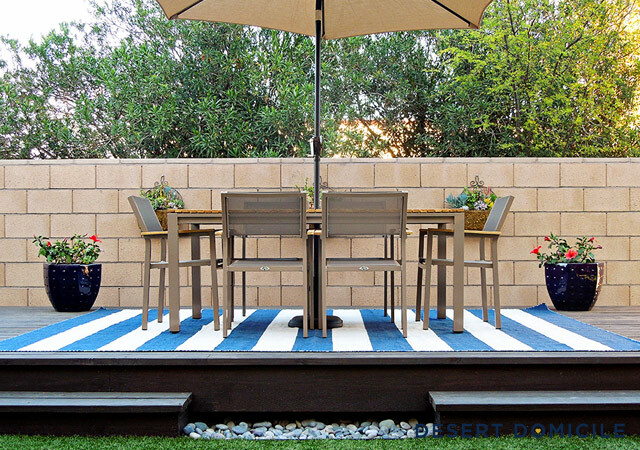 I added a striped outdoor rug from The Home Decorator's Collection. 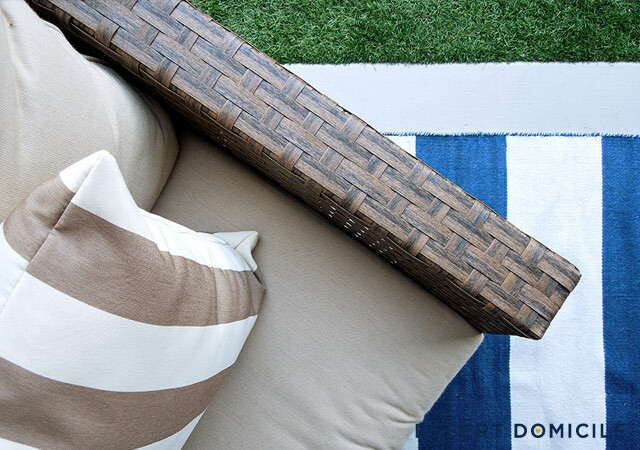 I decorate with a lot of navy inside our house and wanted to bring some of it outside too! I also added a sectional to our space – something that's been on my wish list for a while! 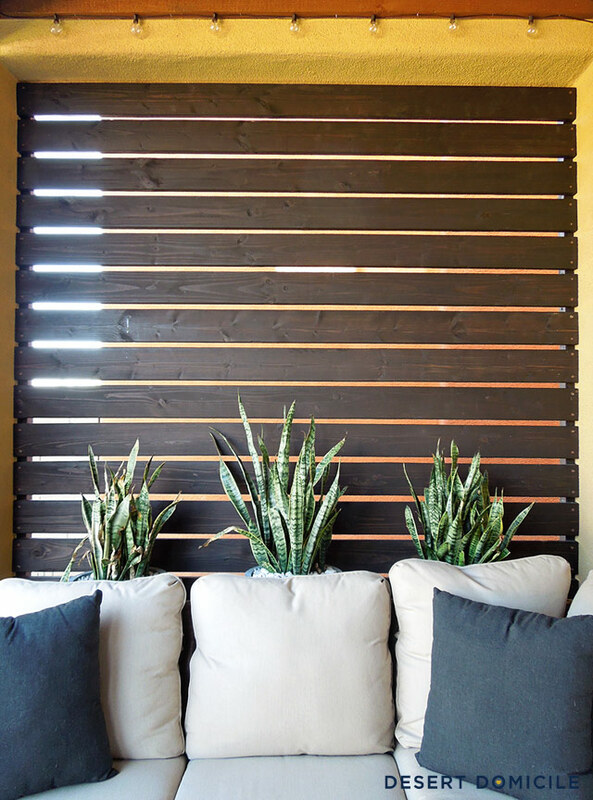 I love how the varying tones of brown in the sectional complement the dark wood tone of our slatted screen and the medium wood tone of our patio's beams. It's a perfect combo! 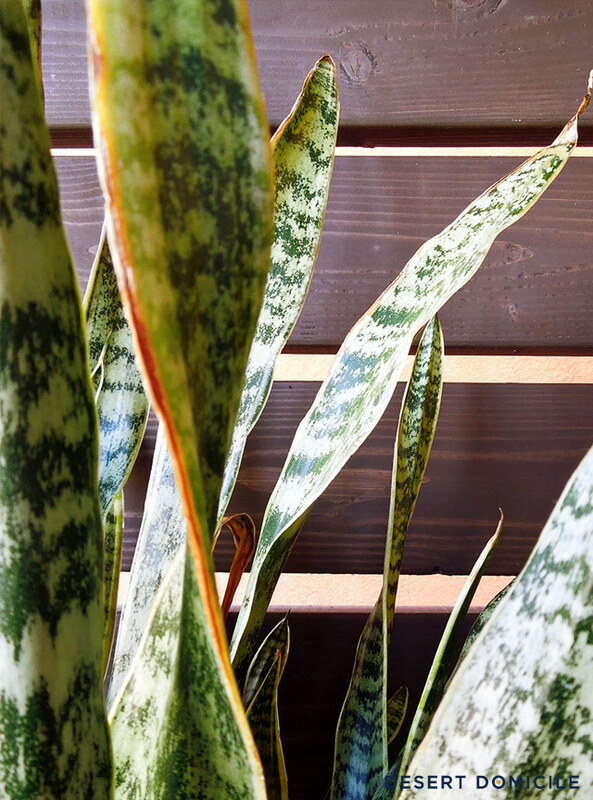 I placed a trio of snake plants behind the sectional to add some height and greenery to the space. I also added a chair to the corner of our patio and a coffee table to the center to round out the living room look. 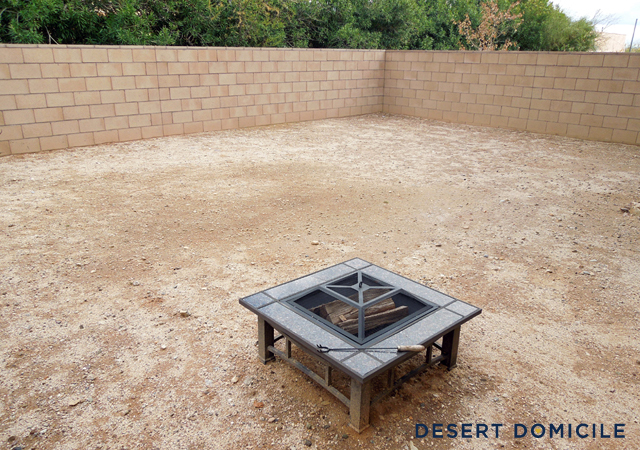 Our fire pit lounge area is off to the side of our back patio. I tucked the lounge area into the corner of our yard so we could add an L bench against our house and our fence wall to get the most seating out of the space. We lined the bench with a ton of throw pillows since our house and fence wall isn't very comfortable to lean against. Eventually we plan to add a thin cushion to the top of the L bench for some extra comfort. Underneath the bench is a 6 x 6 grid of 24" x 24" pavers (two rows of the grid are underneath the L bench) that my contractors laid out for me. 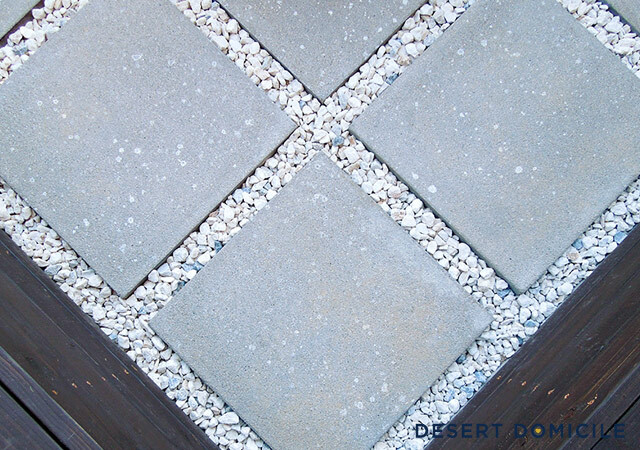 They got the entire paver grid done in a day – something that would have easily taken me and my fiancé a month! 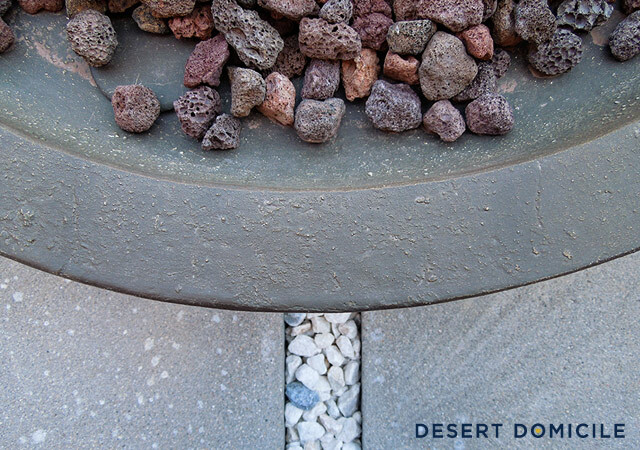 I wanted to add some extra contrast to the space so we added a border of Mexican beach pebbles around the whole paver grid. 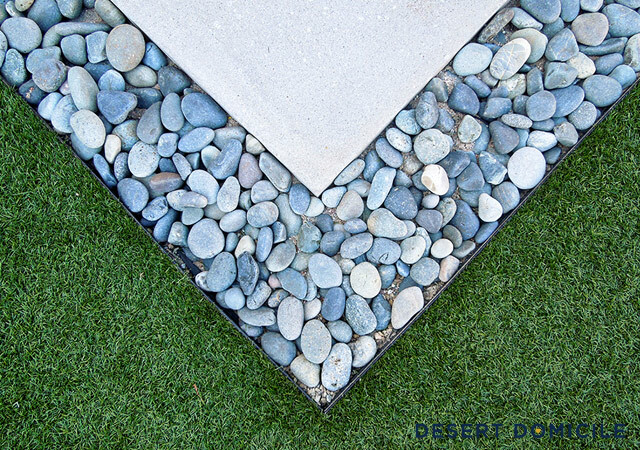 The border is held in place with landscape edging to keep the lines nice and crisp and to keep the Mexican beach pebbles from scattering around our yard when our dogs are running around. We placed our new fire pit directly on top of the pavers. 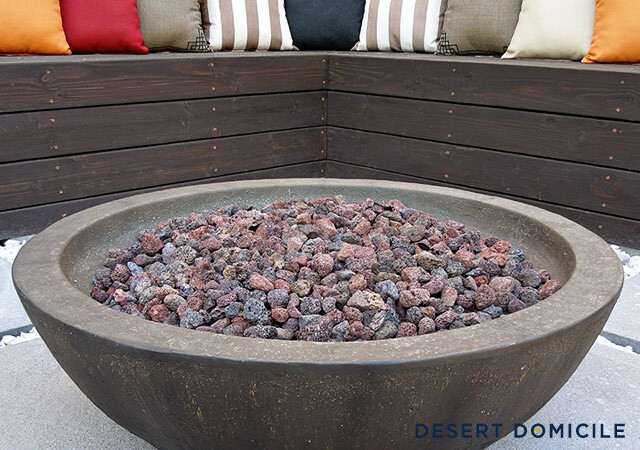 Our fire pit is a work of art! 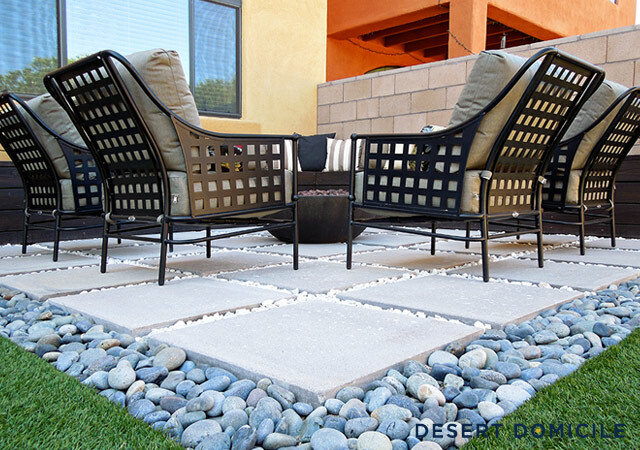 I love the contemporary look of it and how the circular shape helps break up the boxiness of the bench and paver patio. It runs on propane so our contractor buried the line to the propane tank in the marble chip grout line. He ran the line into the inside of our L bench, where our propane tank is hidden! A portion of the top of our bench lifts off for easy access. 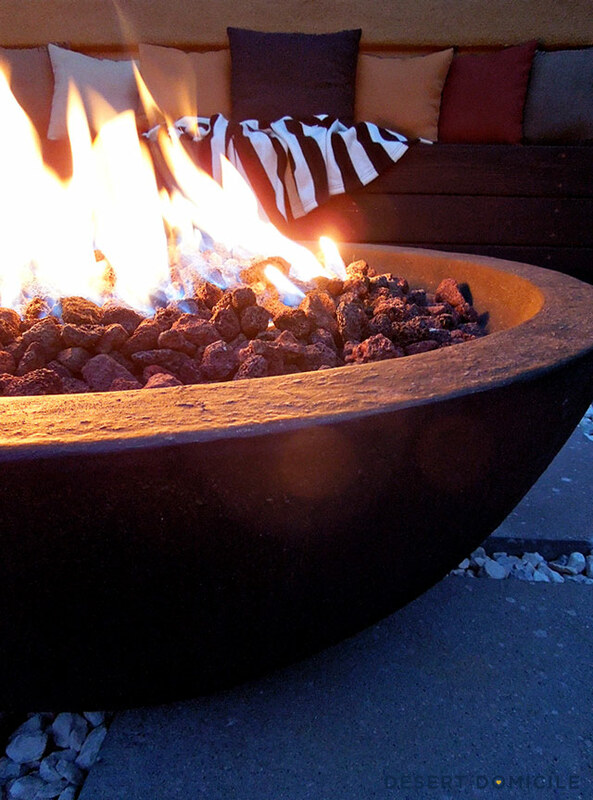 It gives off a ton of heat and makes the cold desert nights a little more cozy! We surrounded the fire pit with a set of chairs that are so comfortable I may or may not have almost fallen asleep in them! 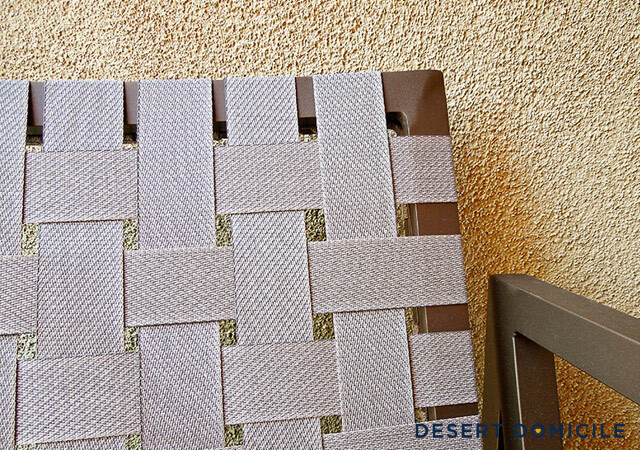 I love how the square pattern on the back and sides of the chairs mimics the grid pattern of the pavers. S'more's party at my house! 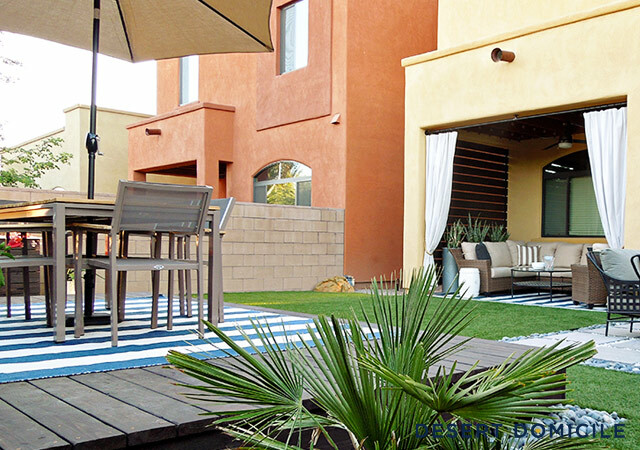 It's hard for me to pick a favorite space in our yard but our floating deck might be it! Our rockstar contractors (I seriously can't praise them enough!) did such an amazing job building it and I'm so happy they did because I wouldn't even know how to begin! I wanted our deck to be proportionate to our yard and to provide space for dining and dancing! I measured out the space in our dirt and decided on the final dimensions of 10' wide by 18' long. 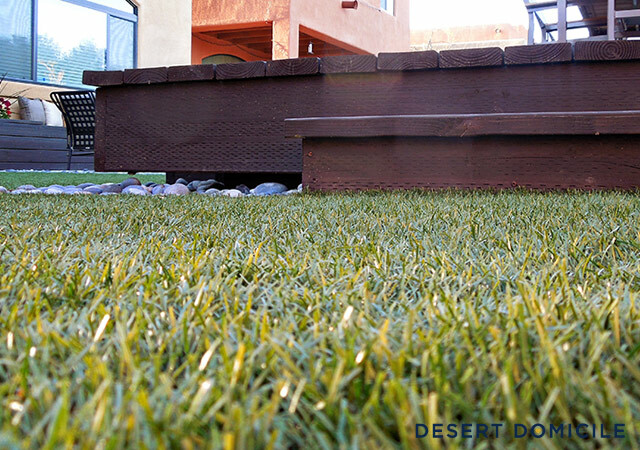 I gave our contractors a rough mock up of the deck and they made it come to life almost overnight! The addition of the deck steps is something I hadn't thought of (I thought we'd just step up to the deck from the ground) but I love how they turned out and how much easier and safer it is to access the deck. Our dogs love running up and down them too so they're a win-win for everyone! Our new dining set caught my eye at our local Home Depot. I fell for the neutral finish and clean lines. 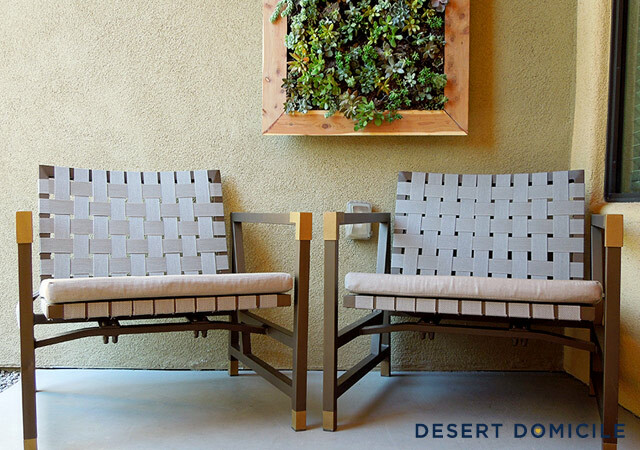 Each piece felt heavy and well made and the springy mesh seats we something I could see ourselves sitting in. I was right! I really wanted to add a pergola above our deck to give our backyard some much needed height but we weren't allowed to due to our HOA's rules. Rumor has it the rules may change though so keep your fingers crossed for us! Anyway, we added an umbrella to our dining set instead! 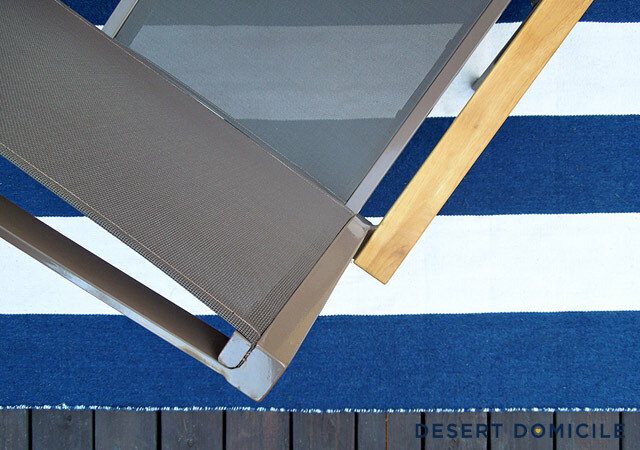 The fabric on the umbrella is the same fabric we chose for the cushions on our sectional and chair. Repeating the same colors/fabrics several times throughout your space is a great way to make separate spaces feel connected to one another! Like everything else in our space, we wanted our dining area to feel like it was an extension of the indoors. We hung a trio of succulent planters on our fence wall to act like art and to give us something beautiful to look at when we're dining al fresco! 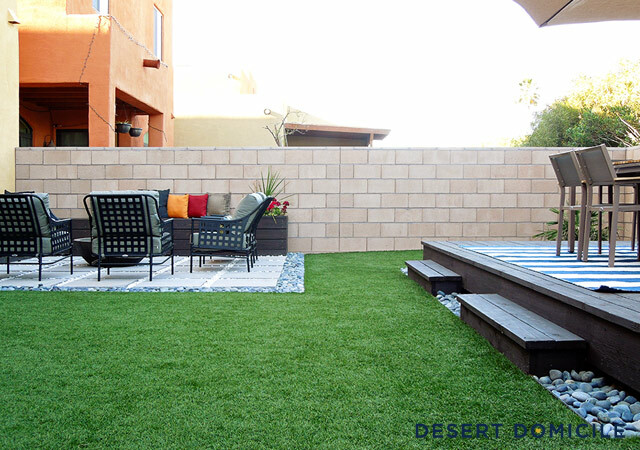 The biggest change we made to our yard was adding AstroTurf! I was sick of staring at all of the dirt in our yard and I really wanted to replace it with anything that wasn't brown. I was worried that ground cover, like pea gravel, was going to get stuck in our dogs paws and be uncomfortable under their feet. 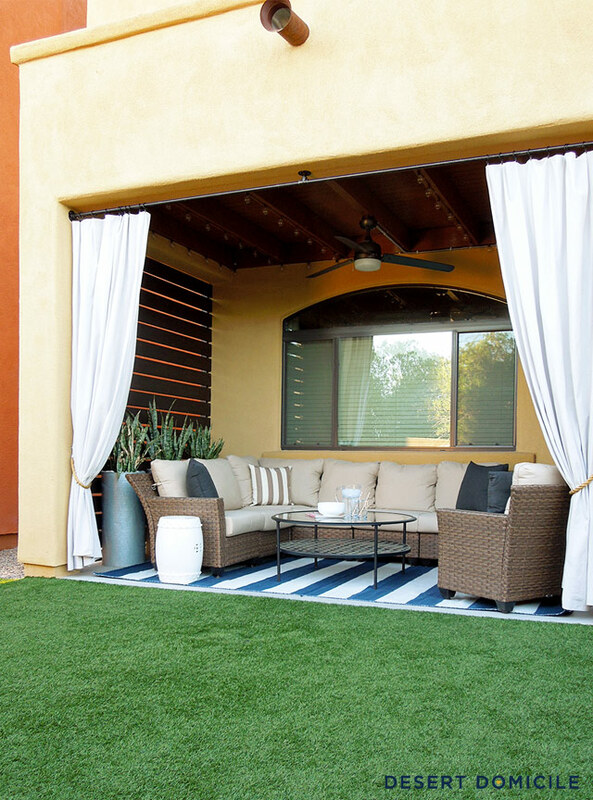 I wanted to find something that would stay as cool as possible and would be comfortable underfoot and AstroTurf was the perfect solution! Why AstroTurf and not real grass? 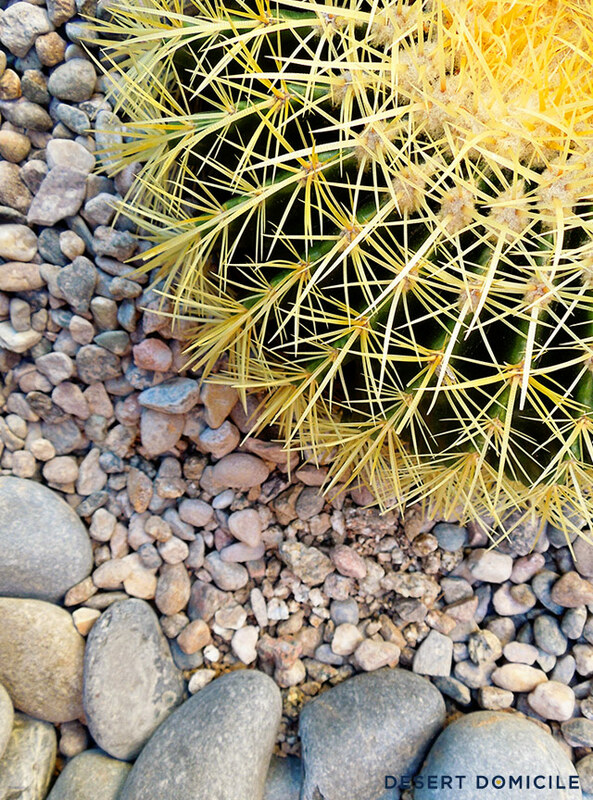 Well, unfortunately, it's nearly impossible to grow grass in the desert and even if you're successful at keeping it alive, your water bill is probably sky high! And honestly? I didn't want to have to deal with the maintenance of real grass! We only have to do two things to keep our turf looking it's best. 1.) Broom it in the same direction when it looks a little compacted so it gets fluffy again and 2.) 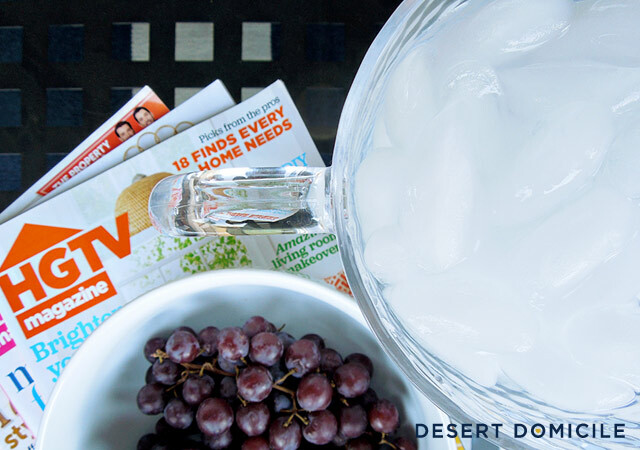 Hose it down with water and a diluted Febreze mixture once a month to get rid of any dog odors. That's it! The AstroTurf stops where our side yard begins. 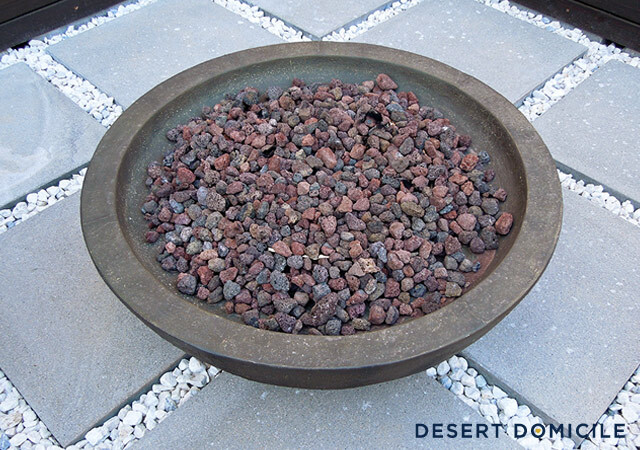 We used pea gravel and Mexican beach pebbles to create a dry river bed in our side yard. I know I mentioned worrying about the pea gravel getting stuck in our dogs paws but there's not much for them to do in the side yard so they don't really bother with it. They have walked on the pea gravel and nothing got stuck in their paws but we could tell they were uncomfortable so we try and keep them away from it as much as possible. 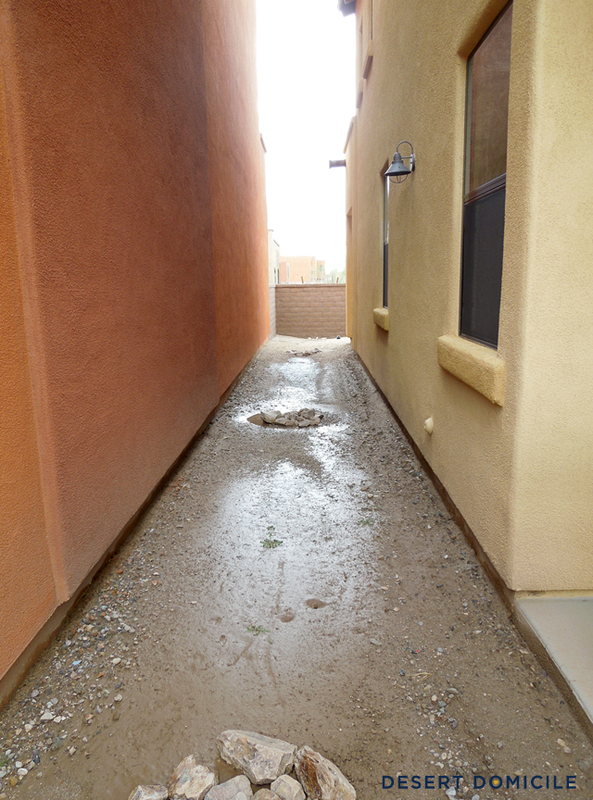 Anyway, our side yard had a lot of drainage issues that we needed to address. 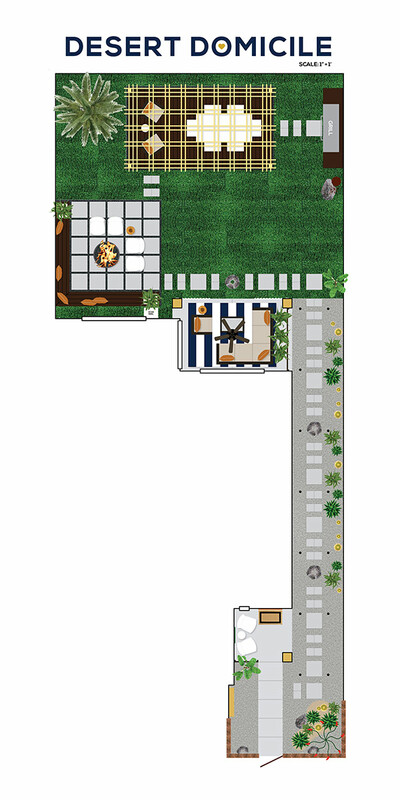 I really wanted to add a paver walkway to our side yard so it would tie in with our fire pit lounge area but I was told by our landscapers that it wasn't a good idea. 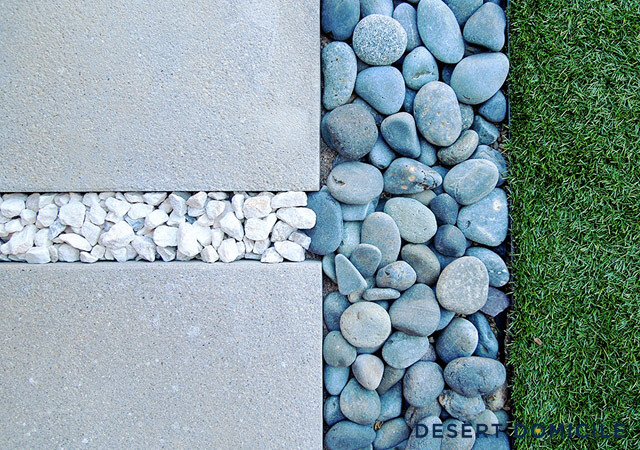 Sand would need to be added to the ground in order to make the area level for the pavers to be put down. 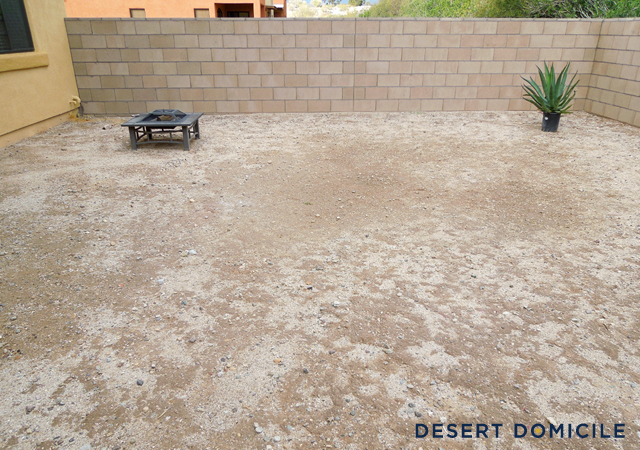 After several heavy rainstorms, the sand would start to be washed away which would make the pavers move and come unlevel. 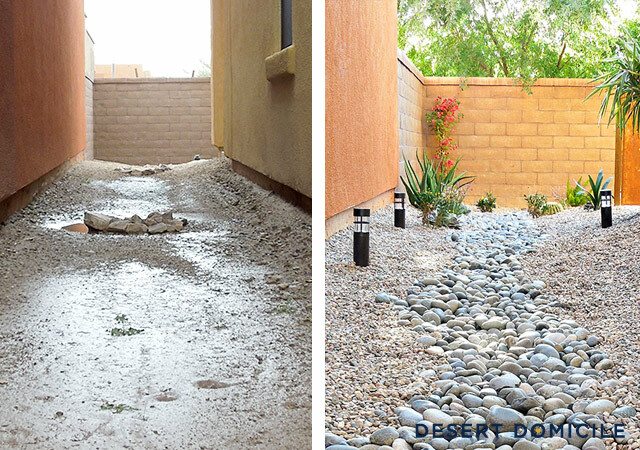 I didn't want to have to be constantly fixing the pathway so we nixed our plans and added the dry river bed instead! 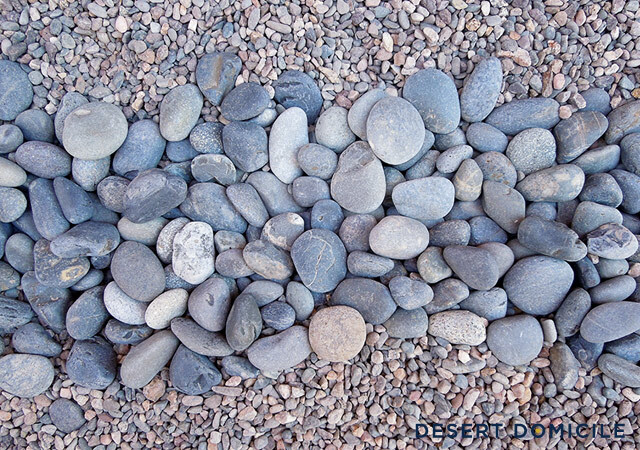 We trenched out the area to give the rain some place to go and then we made a wavy pathway out of Mexican beach pebbles. 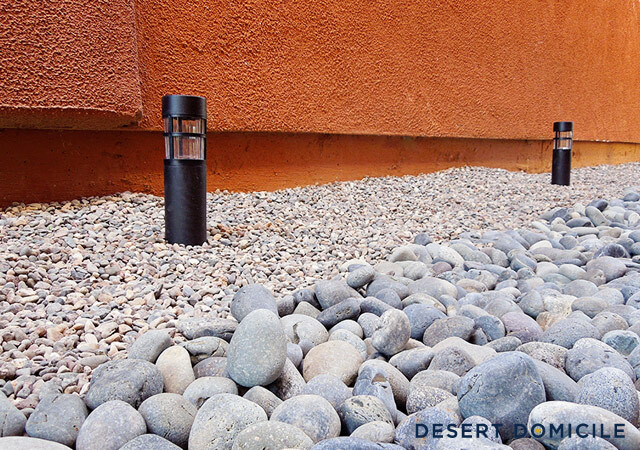 We filled the sides of the pathway in with pea gravel and lined the space with solar lights. Although this wasn't my original plan, I like the way it turned out and am really hoping it will prevent our yard from flooding like it used to! Fingers crossed! 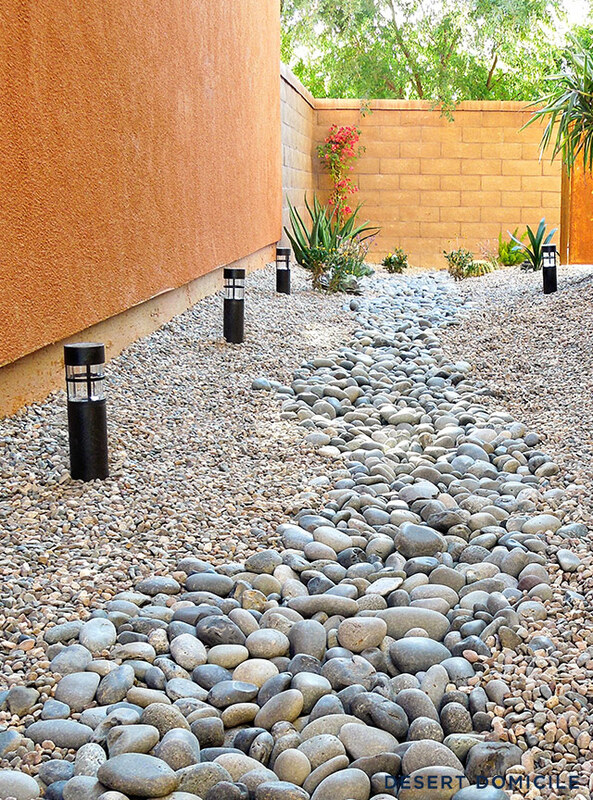 Our side yard flows into our front courtyard so we ran the dry river bed through the space and landscaped around it. I wanted to add a variety of plants so I mixed succulents in with some daisies and kangaroo paws. 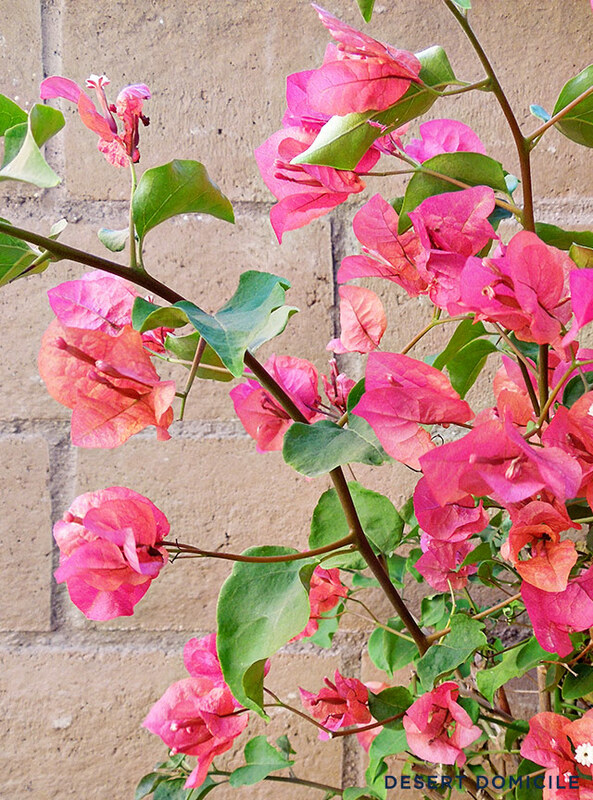 I also added a bougainvillea to the corner for some much needed height! 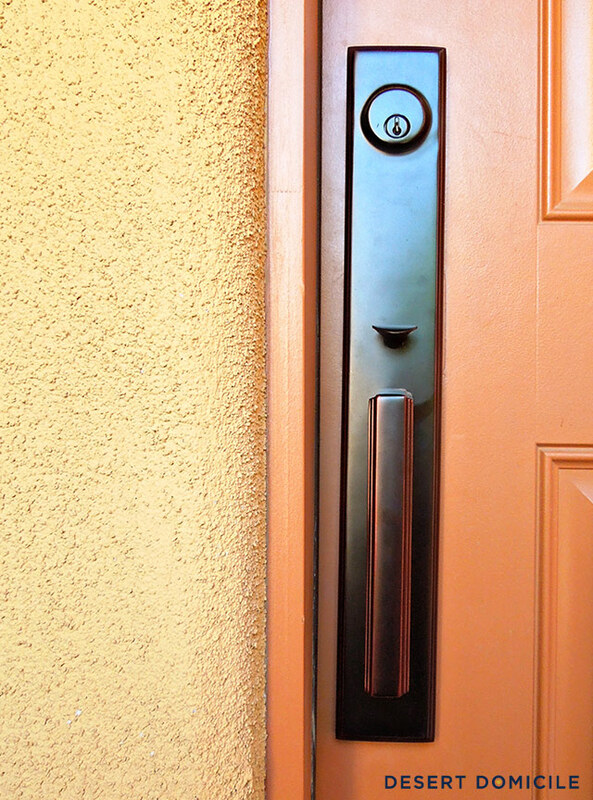 We replaced our builder basic door hardware with a new set that's very modern and very us. 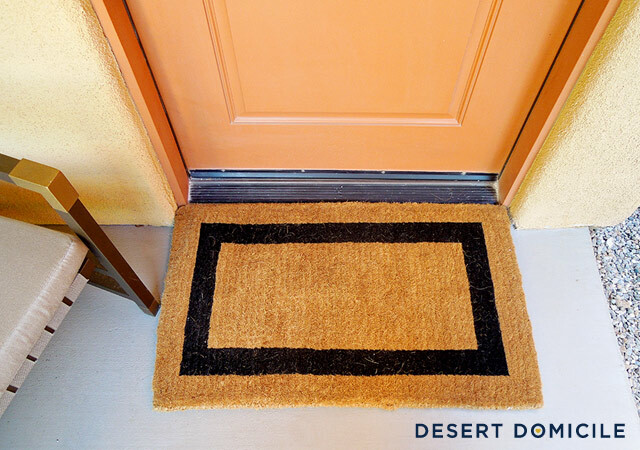 We also replaced our old doormat with this black bordered version. I love how plush it is and how the black border mimics the frame of our window. They're very Mid-Century Modern – my favorite! 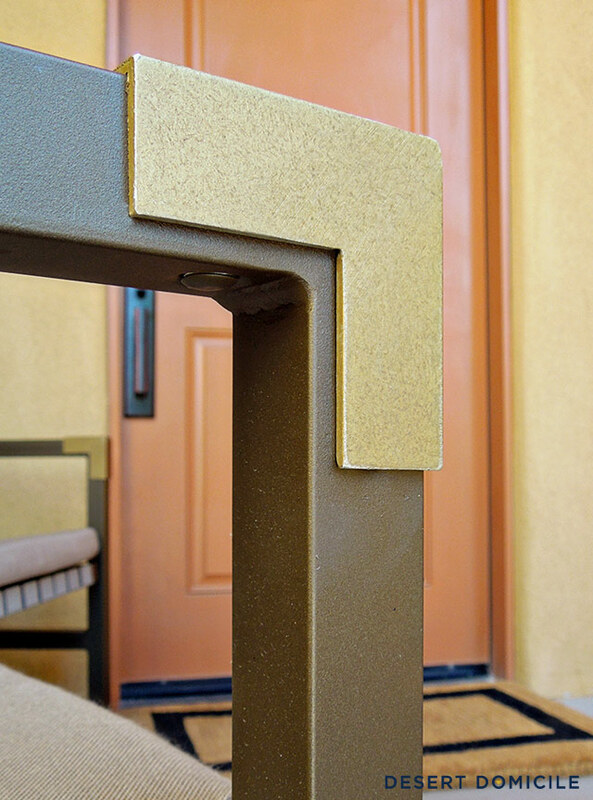 I really love the gold touches on the feet and elbows of the chairs. It reminds me of campaign furniture, which I can't get enough of. In keeping with our theme of bringing the indoors outdoors, we hung a vertical succulent garden from our light fixture to resemble a piece of art. I was terrified this project was going to be a big failure but somehow it worked! A few of the succulents have fallen out but everything is still alive so I consider that a success! We absolutely love our new outdoor spaces! We've spent more time outside in the past month than we have in the past 3 years we've lived in our home! 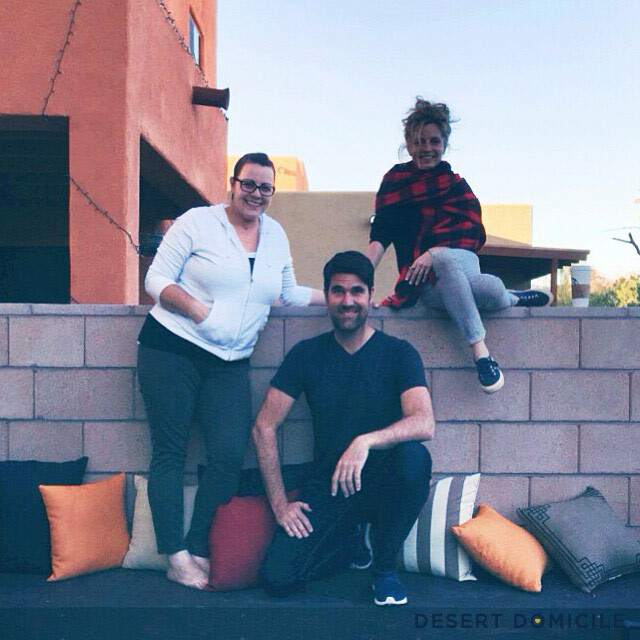 Never in a million years could I have dreamed that our yard makeover would be possible! If The Home Depot hadn't partnered with me, our backyard would still be the worst looking one in the neighborhood. Now I'm convinced it's the best looking one! Ready for some before and afters?! What do you think of the changes we made? Pretty incredible, right?! Click here to see what happened behind the scenes of the makeover! I acknowledge that The Home Depot is partnering with me to participate in this Patio Style Challenge Expansion (the “Program”). As part of the Program, I am receiving compensation in the form of products and services, for the purpose of promoting The Home Depot. All expressed opinions and experiences are my own words. My post complies with the Word of Mouth Marketing Association (WOMMA) Ethics Code and applicable Federal Trade Commission guidelines. that is awesome. super jealous. 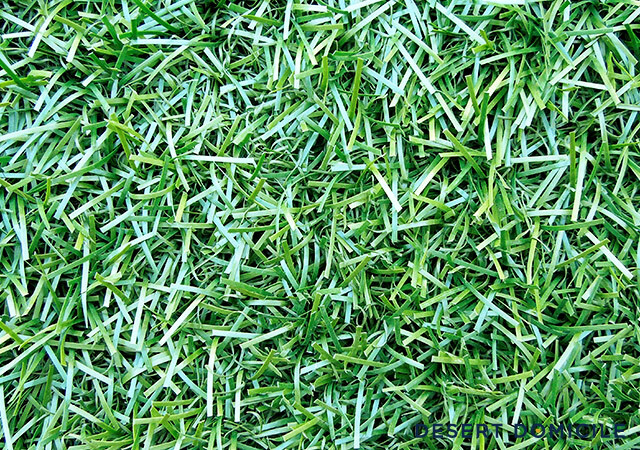 love the astro turf, the boyfriend would love to install it at our house. enjoy! Thank you so much! The AstroTurf is amazing, I can't recommend it enough! Just gorgeous! 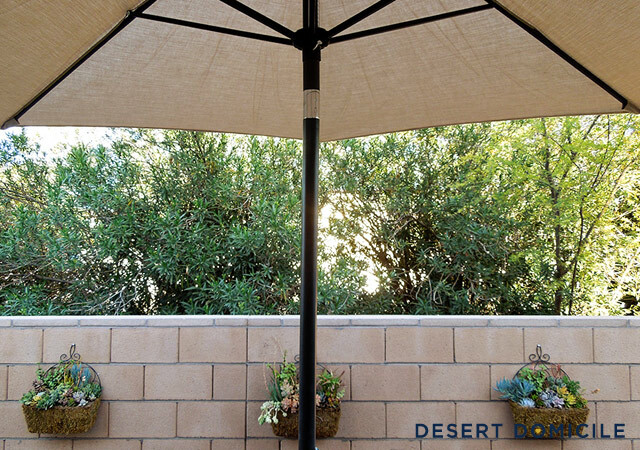 I would add some plants by the fence to block your neighbor's prying eyes especially with a tall and raised dining area and add some sort of awning above the window in the firepit area. Nicely done! WOW!!! it is amazing!!!!!! i am blown away. I love this!!! 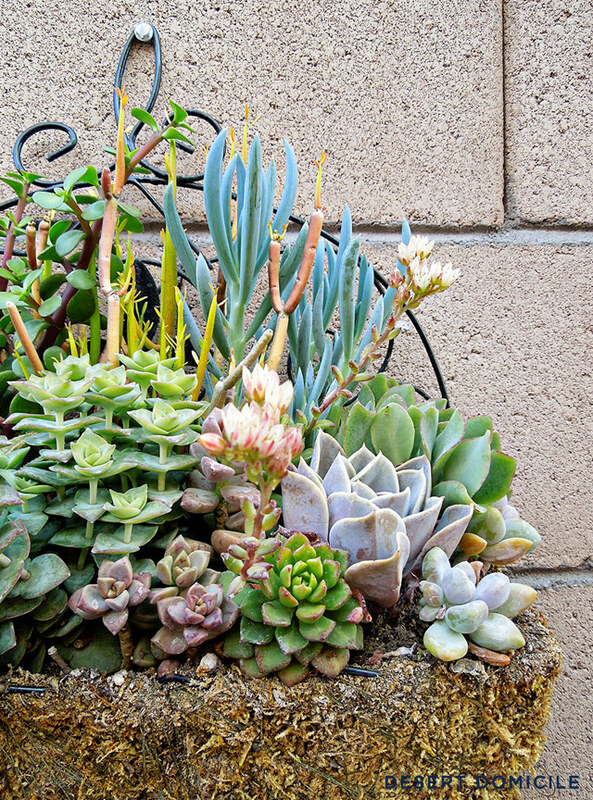 I live in Missouri so we don't have the same issues in our garden, but I could definitely get on board with something like this… low maintenance! That would be so nice as I just spent a good 30 minutes picking up dead leaves from our neighbor's trees and I'm no where near done. Congrats on all the beautiful new decor!! Thanks Megan! Sorry to hear about your leaves! My fiancé thinks I'm crazy but I used a Shop Vac to vacuum up all of our tree's dead leaves haha I even vacuumed some dirt out of our AstroTurf when I was done planting some succulents. It may be crazy but it's fast and it works! What an absolute dream! You did a phenomenal job...so happy for you! Oh my GOSH, Caitlin. It is spectacular. I'm basically speechless. I love every single detail! Ahhh, thank you! I love that you love it! I think I accidentally deleted my comment, but I just wanted to say that you created an incredibly inspiring outdoor space, LOVE it all! Um. Serioulsy. HOLY CRAP. This entire transformation is amazing. I remember you talking about having nothing in your yard when we got together a few years ago, and whoa. This is a far cry from dirt. I love the patio area with the curtains and the twinkle lights. And that floating patio is amazing. I'm just green with envy. I want to live in your back yard. This is totally ridiculous!!!! Ridiculous in the most awesome way. I'm going to live with Kim in your backyard! Wow! Wow! Wow! Caitlin, it's so beautiful! it's so much to take in at once, I'm overwhelmed. I love it! Congrats on the massive makeover and collab! Holy BEAUTIFUL! I have serious backyard envy right about now. And I love that it actually looks user-friendly. So often I see outdoor spaces that just look like they would be hard to live in and hard to maintain. Yours is gorgeous and practical too. Great job!! Wow! So, so good Caitlin! Love everything! Whoa! It looks SO great! 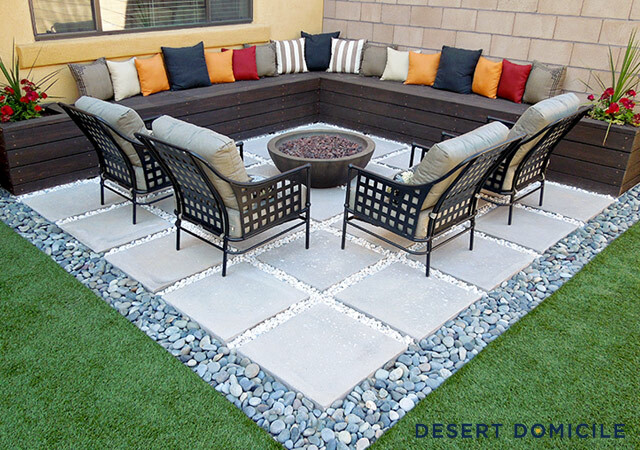 And I love how functional each of the "zones" is.....you're going to love the firepit; I think every house needs one :). And I'm about ready to tear up my grass in rain soaked Georgia and throw down some astro turf...so much easier, and it looks so good! Absolutely incredible transformation! I love the way you laid out the space and what you did with it!! Seriously bravo!! Such a complete 360! I cannot believe how real that astro turf looks. Everything is so BEAUTIFUL, love the way you styled everything! Wow! What a transformation. Those chairs next to the entry, swoon! 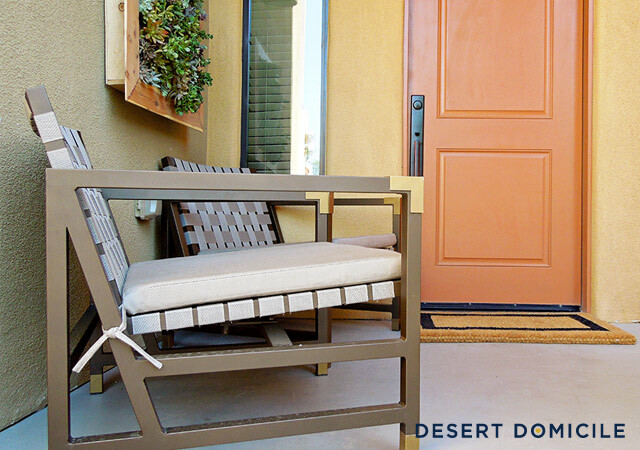 There are not nearly enough of these designs for us desert dwellers. Thanks for the inspiration! Caitlin, you absolutely KILLED with this makeover! It's just freaking incredible! I love every aspect of this design! (And can I just say, I am so jealous of the astro turf? I would LOVE having a lawn that didn't need to be mowed and watered and all that!) Wonderful job!!! Absolutely phenomenal! Such an amazing before and after story. 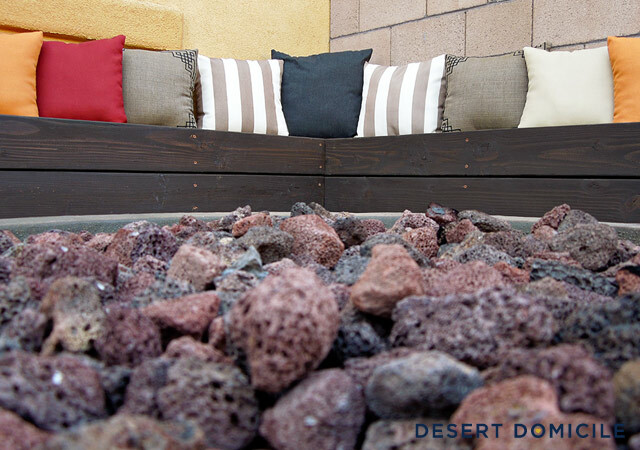 I love every single nook and can just picture all of the fun and relaxation you will have in your backyard for many years to come. I am truly blown away! 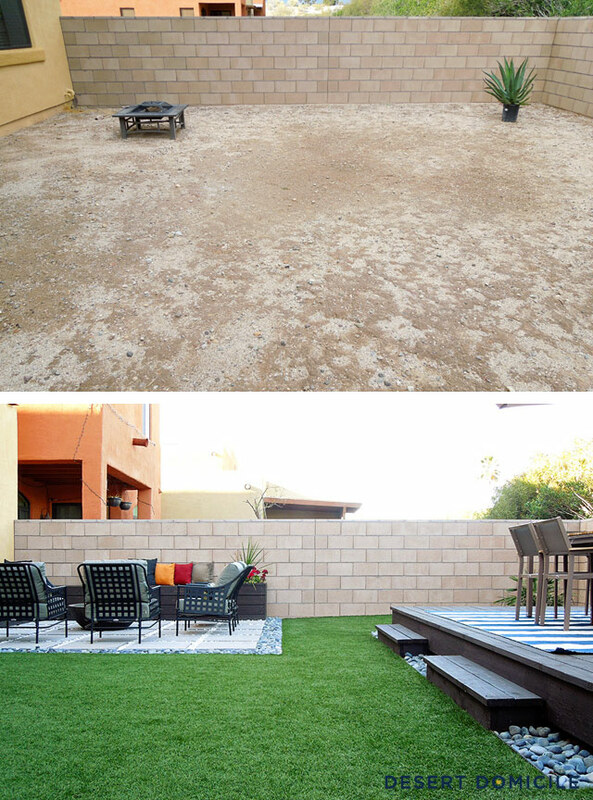 I seriously have a perma grin on my face, love reading though your post and seeing the amazing transformation your backyard has gone though!!! incredible! and I first saw those mid century style outdoor chairs at our local HD and was like WHAT!? I need these! OMG Caitlin!! Seriously! I mean....I was BLOWN AWAY when I saw this reveal on the HD blog. What a truly amazing transformation. I love every detail. The separated zones are such a great design and I love how they all work beautifully together. 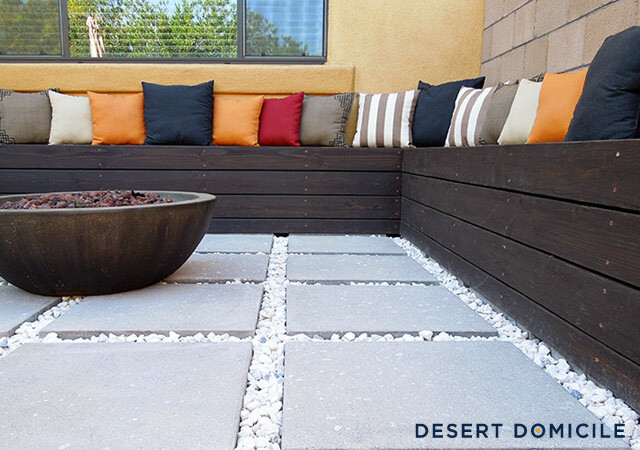 I love the slatted wall, the side yard, and the pavered area of the fireplace zone. So SO good lady. I know you and your soon to be hubby will enjoy it for years to come! Where did you get the 24x24 stepping stones? Hi! 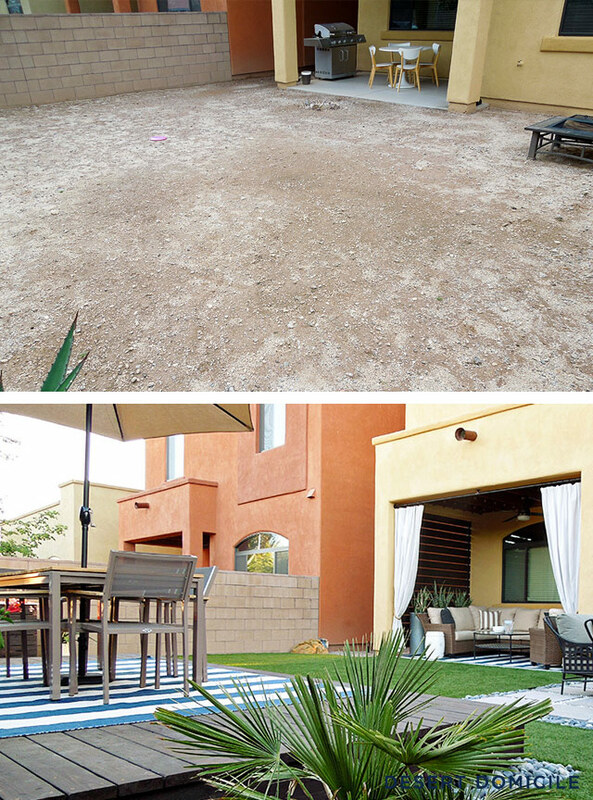 I love your backyard transformation! 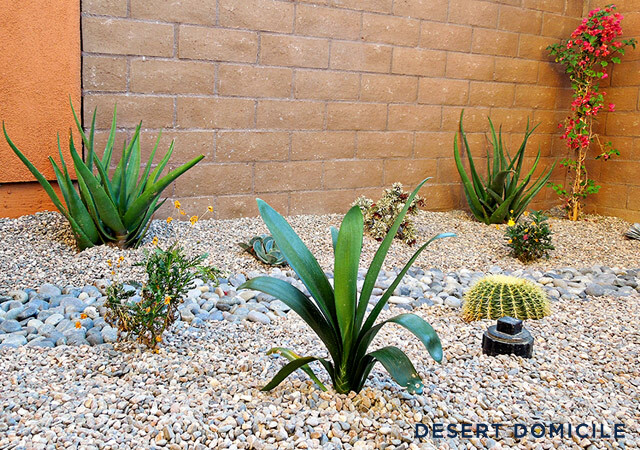 We are in the process of adding a lot of similar elements to our own yard. And I was curious if you remember how many bags of the white marble chips you had to buy for your patio area? Thanks! I somehow stumbled upon this site and boy am I ever glad. I am not know for reading long blogs or responding mainly because I am to impatient.So glad I happen to be in a unusually patient mood this morning. I am a true California girl who loves to garden-so much so I ran a very successful interior/exterior plant service for 20 years. Moving to the desert was a shock to say the least. 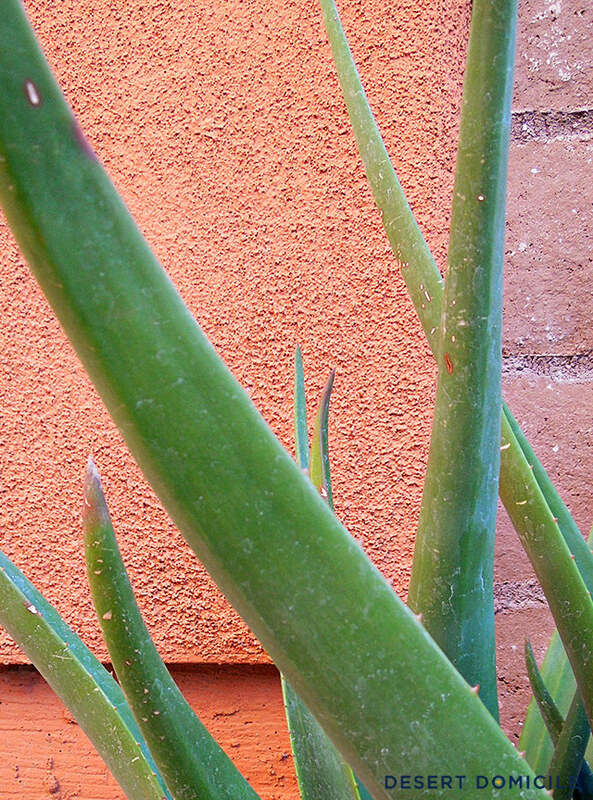 I should have a plant cemetery in my backyard. My Home Depot credit card would be a lot less if I just gave up. But I am not a quitter-or I am just stubborn, probably a little of both. Love your attitude about making something work. I have renewed inspiration thanks to you. Now I just need to enter & win a contest. Thanks so much for sharing your journey. This is such an amazing transformation! I have seen pictures on pinterest of a grill surround. Was that part of this transformation? If so, do you have any steps on how you made that? TIA! HI love the styling was also looking for steps on how you made the grill surround! So beautiful! 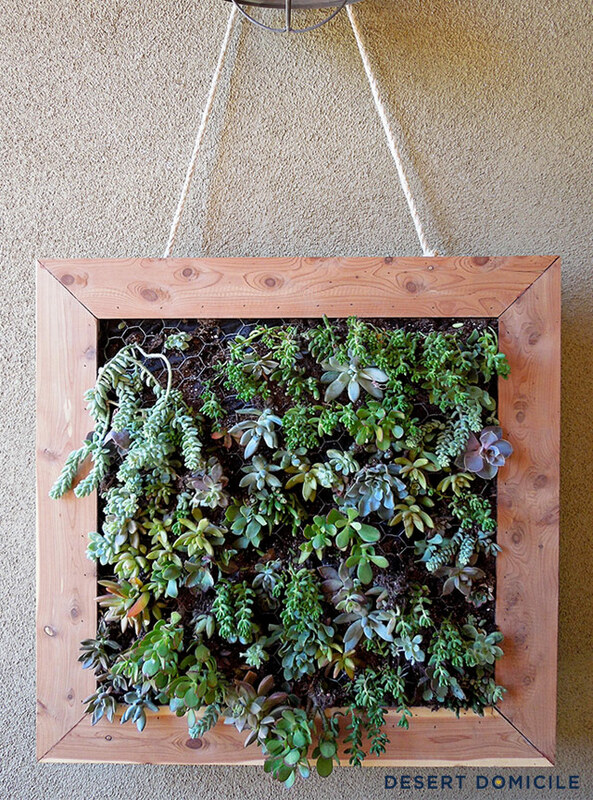 How do you water the vertical succulent garden? Would it be safe to bring indoors, or does it drip? wow, this is so beautiful!! 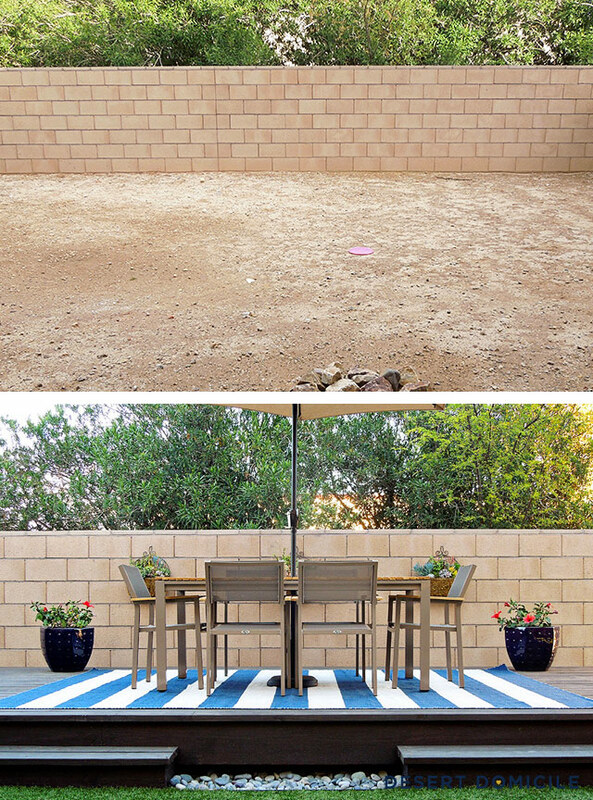 Love the before and afters - very inspiring. 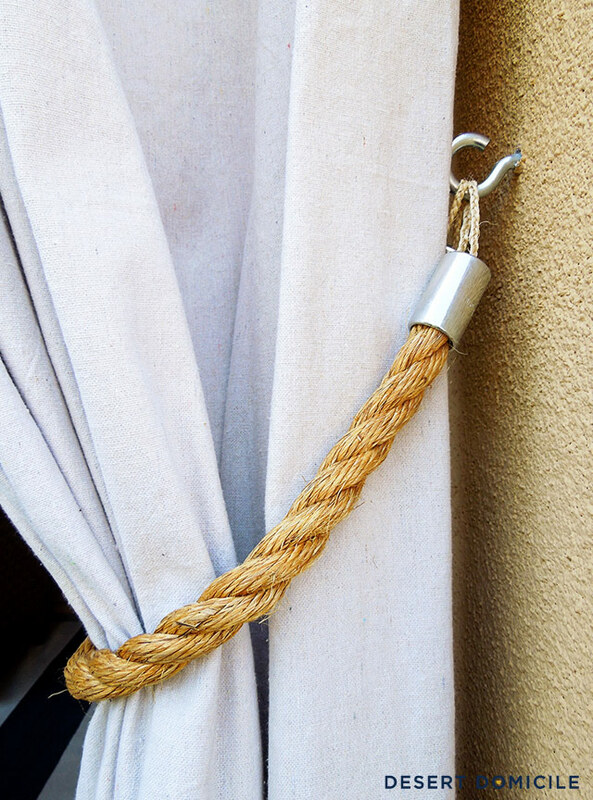 I came across your post because i'm researching how to make outdoor curtains. How is the canvas holding up for you? I am finding different opinions about whether I really need to use outdoor fabric or whether I can just use canvas like you did. Please tell me how they're doing over a year later!! I love the dropcloth idea and those tiebacks are great.